Since baseball is a big part of our summer, given Nathan’s active involvement in the sport, we decided to spend a day exploring the baseball culture while in D.R. 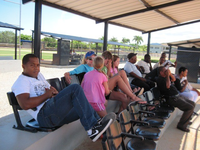 One of the ways to do this is to take in a game at one of the MLB training facilities. Fortunately the manager of our hotel had a friend who worked for the NY Yankees. Typically these facilities are off-limits but through his relationship we got in to watch a game between the Yankees and the Marlines. It was a lot of fun seeing future MLB stars up close. We even had a chance to give away a few "gospel" baseballs and tracts to some players. These are multi-colored baseballs that provide a simple and creative way to tell the good news of God’s redemption. We brought a dozen or so balls with us to give away. Another opportunity came on the beach outside our hotel. Every morning several local teams would fill the beach as they worked out, trained, and practiced. We met a few who spoke broken English and did our best to relate the gospel and give away our "gospel" baseballs.